Another enticing week of the Egyptian Premier League football has ended, and has left us with some thrilling results and sumptuous goals. From Dakhleya’s shock win over Al Ahly, to Mohamed Abdelwahed’s stunning double against Ismaily, and Mohamed Ragab cursing Zamalek yet again. Ittihad El-Shorta drew with Menya in a thrilling game in Abassia. The upper Egyptian club are finding life hard after they earned their promotion back into the top flight but managed to earn a point at one of the hardest grounds in the league. Mohamed Qaoud put Menya ahead before the visitors were reduced to ten men when Walid Anwar received his marching orders. The hosts managed to capitalise on their advantage and equalised through Khaled Qamar. Mohamed Mohsen El-Sayed put Menya back in front before Mohamed Mohsen Abougreisha equalised for Shorta. Bani Suef Telephones and Qanah played out a goalless draw in the Egyptian Premier League to take both sides’ tally to nine and five points respectively. Mohamed Abdelwahed’s two stunning goals helped Wadi Degla overcome Ismaily to hand the Dervishes their first defeat this season. The former Zamalek man scored two sumptuous goals at the start of the first half to give Degla their second win of the season. Although Ismaily pulled one back through Hosni Abd-Rabo not long after Abdelwahed scored his second, it only proved to be a consolation. Al Masry managed to beat Haras El-Hodood courtesy of Ashour El Adham’s wonder strike. The former Zamalek midfielder unleashed an absolute screamer from long range which left Mohamed Fathi helpless. Petrojet managed to go top of Group B with a 2-2 draw against Zamalek. Despite going behind in the opening seconds when Peter Udo put through his own net, Petrojet managed to equalise through Zamalek’s nemesis Mohamed Ragab. Ragab managed to score again to make it 2-1. However, Mohamed Ibrahim converted a late penalty to make it 2-2. 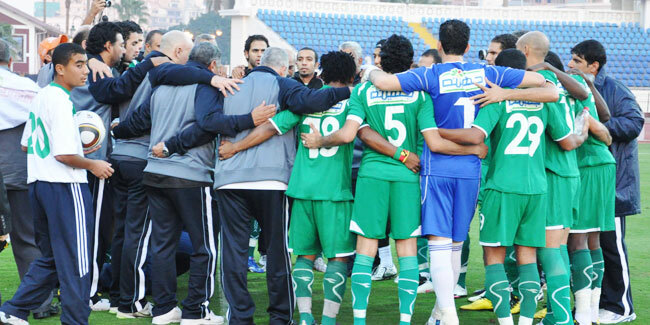 Arab Contractors managed to climb top of Group A with a 3-1 win over El-Gouna on Monday. The team that was in a relegation fight only one year ago are leading the way in their respective group. Mohamed Salem put Contractors ahead after only two minutes before Minsu Buba equalised towards the end of the second half. Mohamed Fadl and Mohamed Farouk Salama then scored two goals in quick succession in the second half to win the game for Contractors. Al Ragaa and Misr El-Maqasa drew 0-0 at the El Maks Stadium. The result stabilises Maqassa’s position, while Ragaa remain in the relegation zone, and are only in it on goal difference. Ittihad of Alexandria are beginning to achieve results under Dennis Lavagne as they managed to beat Ghazl El-Mahalla in Mahalla to make it their third game in a row without a single defeat. Mahmoud Bazied opened the scoring for the hosts before Ahmed Sherwida equalised for Ittihad. Alaa Kamal then scored a goal five minutes later to put Za’eem El-Thaghr ahead. In the surprise result of the round Dakhleya managed to overcome Al Ahly to hand the Red Castle their first back-to-back defeats since 2007/2008. Ahmed Temsah scored the only goal of the game with a powerful finish with the outside of the boot into the bottom left corner, beating Sherif Ekramy in the Al Ahly goal.